First, congrats to E1 (aka Erin) for being the winner of a full line-up of Want'ems chips and fusion dips! We pulled the winner using random.org. I'll be in touch to make sure you get your new snacks! There is something so fun about having a pizza party. It brings back memories of celebrations in elementary school, get togethers with friends on weekends, and just those lazy nights when all you want to do is order in and watch a movie. And its the perfect opportunity to be creative! When I was home visiting family in St. Louis earlier this spring, my cousin Leslie and her husband Andy hosted the family for lunch. I was lucky enough to grow up just a few houses down from my Leslie and her brother Eric until we were in high school, and then just a neighborhood away. In elementary my brother, cousins and I used to walk to school together, spend our afternoons playing in the yard, and just had fun being kids. As we moved into junior high and high school, Leslie and I had classes together and played softball and lacrosse together. For one year, all four of us cousins were in high school together (Grade 12, 11, 10, 9). It was fun! Now that we live about 1100 miles apart, we don't get to spend as much time together. But whenever we do, we have a great time! 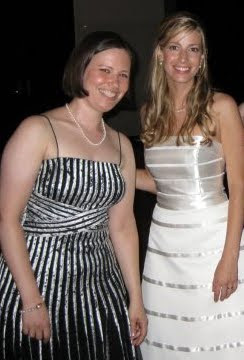 Here's a picture of us from her wedding two years ago. 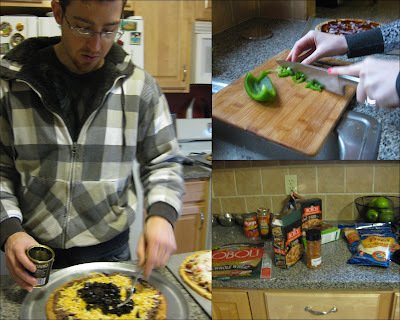 Leslie and Andy love to cook and entertain and they put together some delicious and creative vegetarian meals. When we arrived for lunch, we came in the midst of the pizza preparation. Barbecue "chicken": smoky barbecue sauce, meatless chicken nuggets, fresh diced red onions and tomatoes, and shredded mozzarella cheese. And to start the meal a fresh and health salad topped with a St. Louis specialty - provel cheese! This creamy cheese is a St. Louis original. A patented blend of cheddar, swiss and provolone, it comes in ropes. Technically it can't be called a cheese, it is a processed cheese product. But it is delicious and creamy and was developed for use on St. Louis style pizzas. It melts into a beautiful pizza topping with no stringiness. I love their dishes and bowls! I've already made a few of these pizzas at home since the party. The Mexican black bean pizza is delicious topped with avocado slices, a squeeze of lime and a sprinkling of fresh cilantro. Even though we are meat eaters in our house, we bought the 'chik'n' nuggets to top a deliciously smoky barbecue sauce covered pizza. Thanks Leslie and Andy for a wonderful lunch and inspiration for some great meals. And thanks for always being so much fun! Pizza parties TOTALLY bring back fond memories of my childhood. I love all of these fabulous vegetarian creations! The fresh mozzarella pizza looks delicious! For a second there, your introduction of us cousins was starting to sound like my infamous wedding speech. ;P BTW - The pizzas look very tasty.